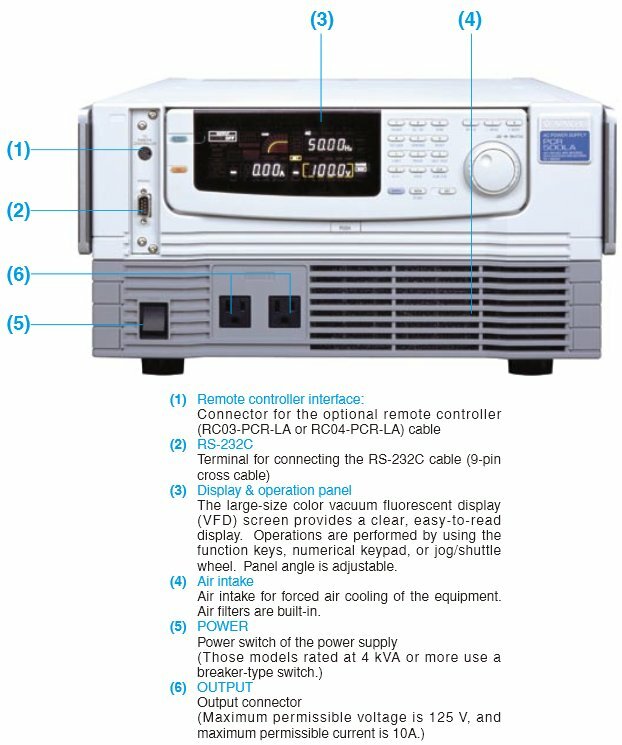 Kikusui PCR1000LA is an extremely high quality programmable variable frequency AC power supply. 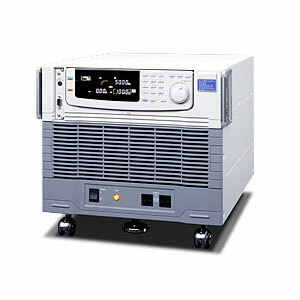 The Kikusui PCR1000LA is an extremely high quality programmable variable frequency AC power supply. Rated as one of the most advanced in the industry, its well regarded in the field and widely used. This top line series supports both AC and DC voltage output, and offers a full range measuring functionality. The 3 output modes that are available are AC mode, DC mode, and a combined ( AC + DC )operating mode. Renowned for being highly stable, it includes a high speed amplifier among other quality features. Testing capabilities with the PCR1000LA are versatile and extensive. There are many test applications including ATE, EMI Testing, Power Supply Environment and Harmonics Current Testing, and testing of Global Commercial supplies. It has superlative I/O characteristics, which reduce the likelihood of a harmonics current from happening. The unit offers advanced functionality over its predecessors in the PCR-L series, while maintaining many of the likable features. Ease of use has been improved upon without sacrificing the reliability or performance of the preceding equipment models. Its complete package of capabilities is extensive, and it is a popular, low cost solution when buying either used or refurbished. Standard equipment includes RS–232C, and the external, remotely controlled interface (which is dedicated). GPIB is also an option. Most all of these functions are achievable when combined with PC usage. When simulation of abnormal power line functions is required, remote control is possible with the RC03-PCR-LA controller, and offers ease of use resulting in lower operation costs. Additionally multi configurations are possible by using either a 0T01-PCR-LA/2 or similar output kit. This allows for building effortless configurations, such as a single phase/single phase three wire output or similar system. Read more about Programmable Power Supplies here. Here, the user is typically working with the keys and shuttle knob to the control panel to set different parameters. The key lock function is available for the AC power supply to stop at a set value. The technician is also able to use the key to the remote controller as a key lock function. A cable which is dedicated usually must be connected with the AC power supply. The maximum output current for PCR 1000 LA is 10 A (rms) AC for the total of two outlets. When using the memory function it is necessary that in order to get subsequent readings out on the proper setting, the frequency and the voltage values must be the same in the current settings for the test. The output capacity of PCR1000LA is single phase 1 KVA and the maximum output current is 10 A/5 A. In addition, the apparent input power is approximately 1 KVA and input current is 12 A/6 A or less. The weight is approximately 49 kg. The dimensions (mm) are 430 (455) W, 351 (415) H and 550 (594) D.
Finally the unit has a self test function which combines as a overload protection failsafe. It also has heat protection and internal circuit protection functions. Overall, the Kikusui PCR1000LA has exceptional safety features, self-protection and maintainability. If you require a affordable, highly advanced power supply, consider a used or refurbished PCR- LA series unit.